Enthusiastic employees outproduce and outperform. They step up to do the impossible. They rally each other in tough times. Most people are enthusiastic when they're hired: hopeful, ready to work hard, eager to contribute. What happens to dampen their enthusiasm? Management, that's what. The Enthusiastic Employee draws on 30 years of research and experience to show you exactly what managers do wrong -- and what they should do instead. Drawing on detailed case studies and employee attitude surveys in hundreds of companies, the authors offer research-proven solutions -- not fads, nostrums, or phony shortcuts. Along the way, you'll identify the dollars-and-cents business case for high employee morale, learn exactly what employee morale means, and discover the specific management practices that offer the greatest positive performance impact. 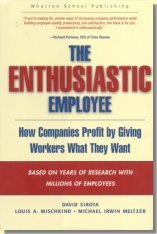 The definitive guide to encouraging, sustaining, and profiting from employee enthusiasm! Techniques shown to increase employee performance 30-40% -- and increase stock performance, too!